In an effort to prevent what happened last Christmas season to a first grader at a California school who was stopped by his teacher from passing out candy canes with a Christian message to his classmates, religious freedom lawyers have filed a request for a preliminary injunction in the U.S. District Court for the Central District of California. Last year, when Isaiah Martinez brought his Christmas gifts to Merced Elementary in the West Covina Unified School District, his teacher took possession of the candy canes. At the direction of the school principal, the teacher instructed Isaiah that "Jesus is not allowed in school" and she removed the candy cane messages from each candy cane, threw the messages in the trash, and handed the candy canes back to Isaiah for delivery to his classmates, according to Advocates for Faith & Freedom. Isaiah then "nervously handed the candy canes to his classmates in fear that he was in trouble for trying to bring a little Christmas cheer and 'good tidings' to class," AFF stated. The canes no longer had a message attached that recited the legend of a candy maker who created the candy cane to symbolize the life of Jesus Christ. 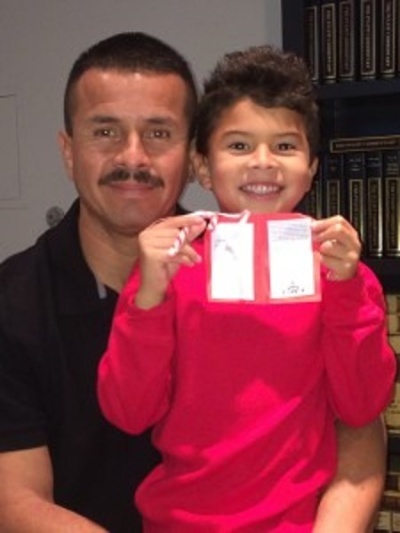 On Wednesday, AFF announced that lawyers filed the request for injunction, that if granted, will prohibit the West Covina Unified School District from stopping now 7-year-old Isaiah (in second grade) from passing out candy canes to his classmates with the Christmas treat's legend attached. The case is already in federal court after the parents of Isaiah Martinez felt the school violated their son's right to freedom of religious speech. Robert Tyler, lawyer and General Counsel, explained their decision to file a federal law suit saying, "the school has neglected to correct its actions, and after exhausting all options to avoid a lawsuit we were left with no choice but to file a complaint in federal court. We are asking the court to protect Isaiah's rights and the rights of others like him from having their religious speech censored. Students do not shed their First Amendment rights just because they enter into a classroom." Attorney James A. Long, legal counsel with Advocates explains the injunction is necessary "because the West Covina Unified School District has made clear that the only theology allowed in the classroom is the government's theology, it has given every indication that it will again prohibit Isaiah from passing out the candy cane legend at his school's holiday party in the name of 'religious neutrality,' Isaiah's constitutional rights will be violated again this year unless the Federal Court grants Advocates' request for a preliminary injunction." Advocates for Faith & Freedom is a nonprofit public interest law firm dedicated to protecting religious liberty in the courts.